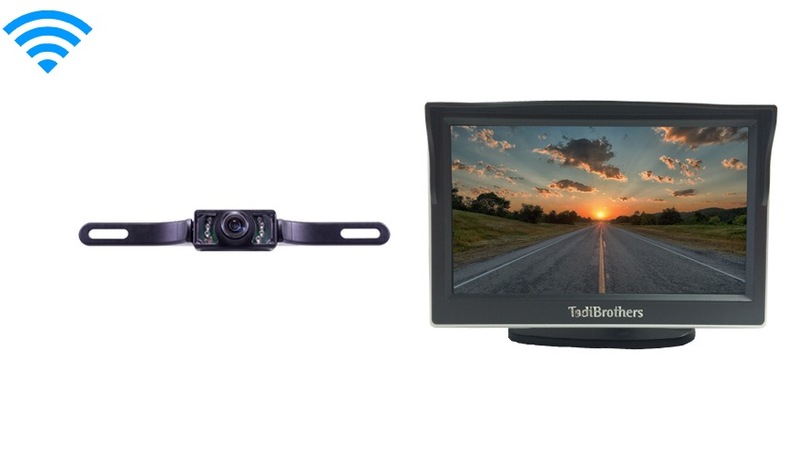 5 inch Monitor with Wireless License Plate Backup Camera Great for All Vehicles! By using the “CUSTOMIZE AND UPGRADE” section at the top of the page, you can choose which style of license plate camera fits your needs and budget. This system comes preconfigured with our standard license plate camera however, we have different styles for all kinds of uses. Please use this guide to help you select which camera is best for you. This Wireless License Plate backup camera is mounted by screwing your current license plate screws through its brackets; it’s a very simple installation. Has optimal reception for up to 70ft this allows it to work perfectly without interruption in any vehicle. The camera can also be adjusted by angling the camera up or down so you can get the perfect view for your car. There is no need to drill any holes or install mounting brackets. The camera has a 120° angle which is best for Cars, SUVs, and Trucks. With 120° everything behind the vehicle can easily be seen, it is also color, waterproof and has military grade night vision. The camera is also durable for use in the roughest weather conditions. This system, like most of our vehicular products that have an LCD screen, can be used for video gaming, consider that a perk or bonus for purchasing our back up system (others block that feature).